Update #2: A few hours later it was unflagged and is currently on the first page of HN. Update #1: Ironically, after ascending rapidly and fostering vigorous commentary over on Hackernews, this article has been “flagged” there . The phenomenon of deplatforming in the internet age, which includes the component of publicly expressed outrage that impels companies to act to remove objectionable content, provides ample fodder for getting all kinds of things wrong against the backdrop of people wanting to put things right. We run the risk that the act of deplatforming can become as extreme as the hate speech it seeks to banish. “the lines are getting blurrier and blurrier. When we hold someone socially accountable for something they say, or some idea they espouse – and we do so by way of silencing them or terminating services of any kind to them, a few things happen. First, we may be seen as exercising our own right to freely speak (and sure, why not?). Second, we haven’t turned that mind around and instead driving the thing underground (where it can and does continue to fester). Third, we willfully and purposefully exercise an act of control over someone else – an act that in actuality we may or may not have a right to. This third point is the blurriest, and it may simply have no good single answer. The more frightful thing that seems to be happening is that now we not only hold the individual responsible, but the platform itself responsible. Why? Should the ISP that serves the user’s connection also be responsible for letting that person even access the Internet? Should the email service provider not share in the blame, by allowing that individual the continued ability to communicate with those he or she forms such thoughts and ideas with? If a group rents equipment to loudly broadcast its ideas, or purchases the paper and supplies necessary for its signs, would we or should we hold the suppliers of these things responsible if the group is deemed toxic? How far down the social-justice rabbit-hole can and should we, the society, go? Where will it end? The reality is that an effective deplatforming initiative is built primarily on the momentum of rage and angst and as it gathers momentum, less and less participants have the presence of mind to approach the subject at hand rationally and objectively. It is, as Elias Canetti termed it, a type of hunting pack known as “the baiting crowd”. “The baiting crowd forms with reference to a quickly attainable goal. That goal is widely known and clearly marked, and it is also near. This crowd is out for killing and it knows whom it wants to kill. It heads for this goal with unique determination and cannot be cheated of it. The proclaiming of the goal, the spreading about of who it is that is to perish, is enough to make the crowd form. The concentration on killing is of a special kind of unsurpassed intensity. Everyone wants to participate; everyone strikes a blow and, in order to do this, punches as near as he can to the victim. 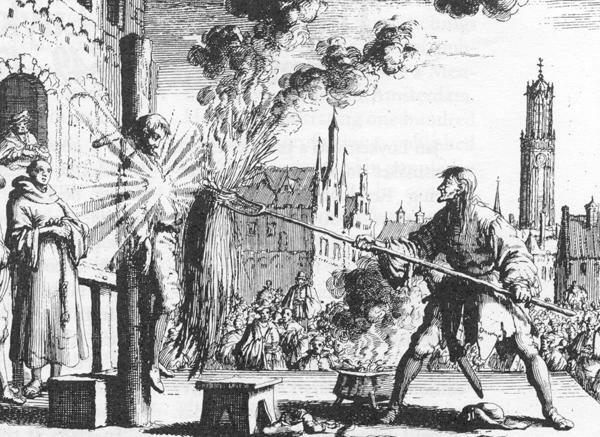 If he cannot hit himself, he wants to see others hit him. Every arm is thrust out as if they all belong to the same creature…. What’s most pernicious about all this is that after it’s over, there are no winners, despite the cheer of those declaring victory. Here’s why: let’s step through the various participants in this and show how they undermined their own long term interests by doing this. This mirrors my take on it when I created an account and took a look around. Gab illustrates a “catch-22” around setting out to be specifically a “free speech platform”. You initially appeal to the most fringe elements of public discourse. Your first wave of users are going to be people for whom this has been a problem, and if you’re an absolutist and let them on then suddenly that’s your base. And once that’s your base, it’s a hard sell to entice the normies into the ecosystem. It’s entirely understandable then, why Gab acquired a reputation for being an oasis of the alt-right. Adapting the “Pepe the Frog” meme as their logo didn’t help, to many that looks like a dog whistle. All that said, their deplatforming is still very much troubling because they claim to have proactively aided the police once they became aware of the perpetrator’s account on their system. This is very much in line with how any other social media platform behaves and is normal and responsible. Contrast Gab’s cooperation in the Pittsburgh shooting investigation with Dailystormer who were widely deplatformed for going the extra mile to be indefensibly abominable pricks in the aftermath of Heather Heyer’s murder in Charlottetown. Big difference, but same outcome. This one rattled me. We use Stripe, it’s our main payment processor and probably the best we’ve ever worked with. But now they’re making fairly loose judgment calls about their clients and letting the actions of a single downstream user, among thousands? (millions?) of a customer decide their fate? It sets a bad precedent. Same goes for Paypal. Does this mean that if Zerohedge, or Black Lives Matter, two of our clients from opposite ends of the political spectrum, post something, or even if one of their users posts something, that is beyond the pale, then we have to worry about having our finances cut off? I know as “the DNS guys” we have a near pathological aversion to single-points-of-failure, but it’s not a stretch to come to the conclusion for any business that it’s not an acceptable risk to have that possibility just looming there and to do nothing about it. That means we will now be looking for backup payment processors. That means maybe after 20 years in business, maybe it’s time to just pull it all in-house. Will any other businesses do the same? Anybody doing the same calculus will arrive at the same conclusion. Stripe and Paypal put the question in their clients head every time they make a judgement call about one. Especially businesses built around downstream users. Is known to skimp on due process before unplugging any domains that garner any kind of quasi-official request , so it’s no surprise that they cut loose Gab’s domain. They’re the 800lb Gorilla in the space and for them, I imagine that it’s all a numbers game. It’s just easier to kick them off than to think about whether they should kick them off. Whenever I come across a fellow Libertarian, anarcho-capitalist or even an Austrian-school economist or any kind of contrarian or heterodox voice and I find out they’re using Godaddy, I caution them that they really are playing roulette. All it takes is some coordinated, well aimed outrage and they’ll be gone. And of course, there are groups out there whose entire raison d’être is to do just that. Came under brief criticism for hosting Breitbart material, but they stuck it out, but this time they also deplatformed Gab. Again – anybody using Shopify may want to rethink relying on them solely. Medium’s suspensions I find quite troubling, considering that they banned Gab’s official account where they would speak to the criticisms being levelled against themselves, but not rebroadcasting any of the material found on Gab that ostensibly made them problematic. 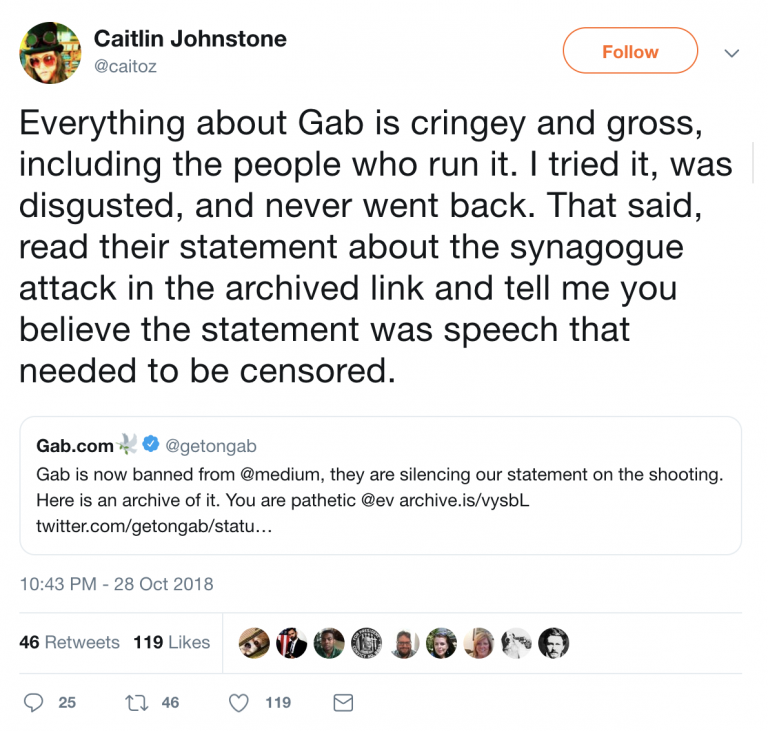 Caitlin Johnstone was exactly correct when she drew attention specifically to Gab’s statement on the Pittsburgh tragedy and posed the question: what about that statement could possibly justify having their voice cut-off? As I write this, Twitter hasn’t killed the Gab twitter account, yet. But they did seemingly coordinate with Facebook et al in the latest Facebook purge of FreeThoughtProject (I listened to an excellent interview with the co-founders on the Tom Woods podcast this morning). Yes, all of the above are all within their rights to deplatform Gab. But all of the platforms that do so simply reinforce the notion in everybody’s head: these platforms have power over us, and they pose existential risk to our businesses or our ability to express ourselves. For that reason, counter-measures will emerge. The traditional argument “if you’re doing nothing wrong don’t worry” doesn’t hold. Maybe today, that means “if you are a social justice minded progressive you have nothing to worry about”. But people forget that pendulums swing, history has certain cycles of mean reversion and then overshoot. In the years after 9/11 I remember very vividly how the Neo-conservative narrative utterly dominated the mainstream media and the word “liberal” was practically a slur. Those days are certainly gone. Do you think these days won’t be? What happens when everybody on the “safe” side of the narrative today is no longer considered acceptable tomorrow? Personally I think it’s more pernicious than a mechanical back-and-forth struggle over control of the narrative. Left-vs-right is a false dichotomy. The real battle, the important one, is between those who would seek to decide what is acceptable for other people to think vs those who would rather think for themselves. It is centralization and consolidation vs decentralization and diversity. The next challenger to Twitter will not be another centralized platform like Gab. It will be decentralized – perhaps a federation like Mastodon, where each node runs its own CoC and community standards – similar to IRC days. Or something blockchain based like Peepeth. Over all this recent attention around deplatforming, I’ve suddenly heard the name Mighty Networks more than once over the past few weeks. Turns out you can create your own network over there, and use your own domain to do it. The tech giants today are by their own actions cultivating the motivation and the will to necessitate the creation of their own challengers and everybody is watching closely what works and what doesn’t. The next wave of disruption will not look like the last wave, the incumbent giants are not impervious to assault. I always like to remind people that Google, Facebook, Twitter, et al may look unassailable today, but so did Yahoo and Myspace, yesterday. The truly fringe discourse, the stuff nobody normal condones will all go underground, where it will be harder to find and monitor and where it will revel in it’s inscrutability, metastasizing into God-knows-what from whence the occasional shock of really unhinged egregores will surely emerge.